The sun sets early here on the east coast. When clouds and rain cover the autumn sun, evening darkness arrives around 5:00 or so. By the time I wandered out onto the tidal flat just outside of Chatham, Massachusetts the premature twilight had already arrived. Observation time was short and the low tide was turning. 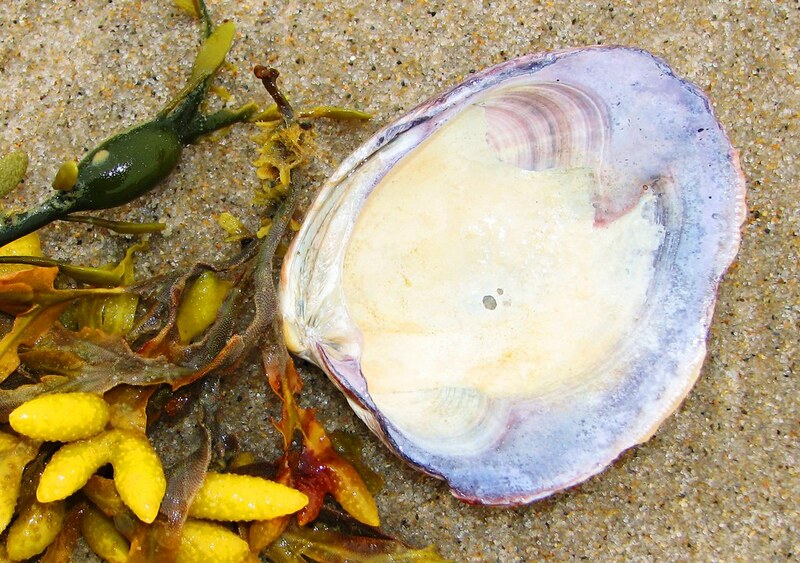 � An even litter of shells covered the muddy surface � ranging from freshly caught and fractured Quahogs, to spectacle case shaped razor clams, small whelks, bay scallops, and plenty of oysters. Although most of these mollusks were dead, a few of the scallops were whole and very much alive.� One small scallop was gaped open as if it were dead but it reacted immediately upon my touch by pulling its lids shut with firm determination. � The next step was to see if I could capture the �squirter� itself. Marine clams bury themselves quite deep and send up a pair of very long siphon tubes that pump in nutrient rich water and pump out the filtered water. Our native Michigan clams and mussels have much shorter siphons and can only partially bury themselves.� I pulled back the rock and dug furiously for a few moments, but the thick marl offered a lot of resistance. It became obvious that I was engaging in a lost cause (the semipalmated plover chuckled a bit at my antics). � Although the entertaining clam was not to be had, a few other under-the-rock residents revealed themselves in the digging fuss. Two small Rock Crabs (see one here) and a tiny fish – no bigger than a minute and not much more than 32 seconds worth -that looked something like a sculpin (see here) were present and accounted for.� Both of them looked slightly steameded that I had disturbed their tidal shelter. � It was with malice toward none that we dined on steamed clams and crab cakes that night at a local eatery.�I have to admit, I�spent an inordinate amount�of time admiring the siphons on�the very dead steamer clams that sat peacefully on�the dinner plate before me. NOTE: This is the�second entry of what�I hope will be a series of entries sent from the road. I guess you could call this my “Wandering Naturalist Series.”� My punctuality will depend completely on internet access�along the way and the amount of daylight.��I have no doubt that nature will provide�ample material. Our arrival on that sandy spit of land called Cape Cod coincided perfectly with the arrival of Tropical Storm Kyle.� I guess you�d call this one a sow-wester in local lingo. Sporadic heavy rains and high winds have rendered this shoreline wilder than usual, but the long beaches were accessible between bouts of �weather�. On one of my brief ventures out onto the open sand to do some beachcombing, I encountered a whole bunch of rockweed, a forlorn looking immature Herring Gull (see here),�and a single Quahog.� Although the rockweed and gull were interesting enough, it was the Quahog shell that caught my fancy. �� Again, I find myself making a direct connection back to the Great Lakes region with this find. It seems the further away I get, the closer I get to home. Wampum beads, made from Quahog shells, were extensively used to construct the Wampum belts once used by regional tribes to record treaties and other great events. � The Wyandot who settled in the Detroit River region in the early 1700�s, maintained a large number of wampum belts as records of their history. Many other tribes did the same. They obtained the treasured beads used in their construction through trade networks with the eastern nations (this was long before EBay). � I have seen several purple wampum beads that were recently uncovered at the former site of the 18th/19th century Wyandot village of Brownstown at the mouth of the Detroit River. Quahogs are exclusive to the northeast coast, so I know those Michigan beads originally came from shells collected around this distant place. � Can you see how simple it is to take something as simple as a pretty beach shell and turn it into a lynchpin of history?� It was, after all, just a Quahog cast up on a lonely beach until we stopped to listen to it. � NOTE: This is the first entry of what�I hope will be a series of entries sent from the road. I guess you could call this my “Wandering Naturalist Series.”� My punctuality will depend completely on internet access�along the way and the amount of daylight.��I have no doubt that nature will provide�ample material. 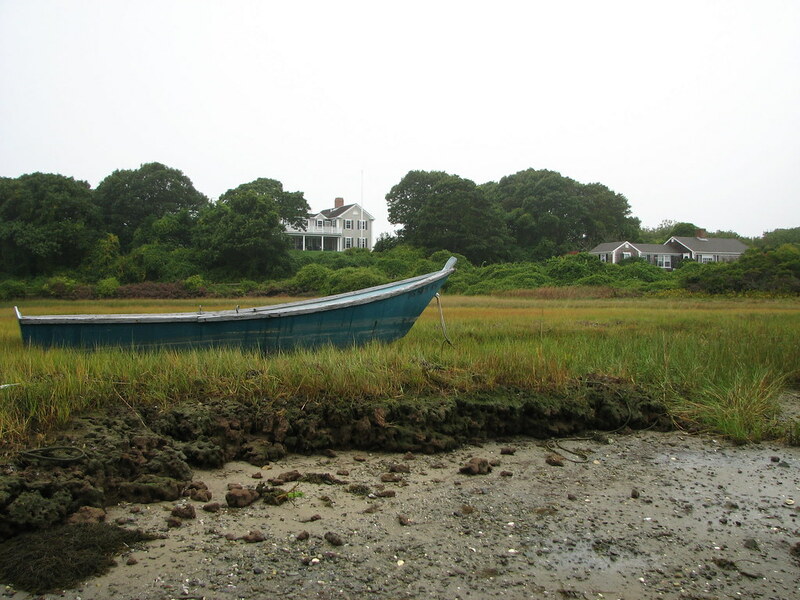 �My journey towards the East coast will eventually take my wife & me to Cape Cod.� On vacation, which for a naturalist is always a busman�s holiday, I find myself comparing things I know back home to things I encounter on the road. I am presently writing this from the mountains of western New York at a place called Kanakadea.� Here in the ancestral land of the Seneca, the heavily forested hills are well clothed in autumn colors. � Emerald Ash borers have killed off nearly every single ash in S.E. Michigan and are spreading like wildfire from the Detroit epicenter. It has been several years since the initial kill, and we have grown painfully used to this absence. Upon entering an area of the country yet untouched by this plague, I am hit by something I didn�t realize that I was missing. Ashes are one of the few trees that tend to turn a deep purple in the fall.� Many will stick with a golden yellow, but enough of them allow their anthocyanins to bake in the autumn sun and turn into shades of deep maroon and true purple. 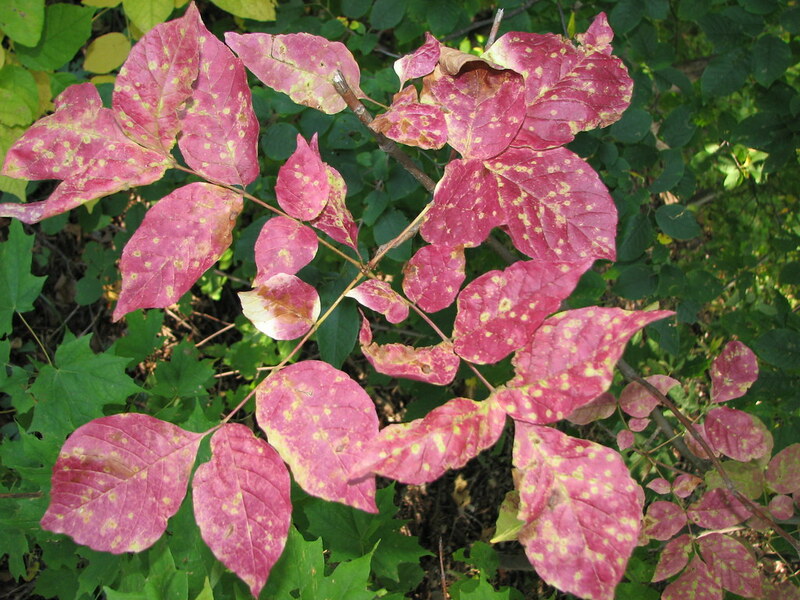 Red-panicled dogwoods are purple leaved plants also and they have been doing a noble job of filling in the gap these past few years, but they are short and rounded. They can never hope to reach up into the canopy and show their purple heads like the ashes. � The incredible vistas afforded by sweeping valley and hillside views have given me a nostalgic glimpse into a recent past. Take a look at the sapling picture above and you’ll see just what an ash can do if given half the chance (you can see that they definitely don’t do things half ash either). �I�m hoping that someday, after the emerald scourge has past, that purple autumns will once again rise from the ashes. When driving along autumn back roads it is wise to keep your eye on the road.� It is necessary to stay on the right side and watch for on coming traffic, of course, but it is also fun to see what is crossing the pavement ahead.� Caterpillars are frequently encountered as jay walkers this time of year and they are, believe it or not, easy to spot. The fuzzy caterpillars of the Tiger Moth family are capable of a pretty good 50 yard dash over the centerline. One such speedster is the larvae of the Giant Leopard Moth. � These larvae feed on common roadside weeds such as plantain & dandelion, so are present at the roadside for much of the summer. Prompted by the diminishing daylight, their tiny lives take on sense of urgency. Not only do they eat more, in order to gain some bulk, but they become wanderers seeking potential hibernation sites.� This, by the way, is the answer to the question �why did the Leopard moth cross the road.�� They cross our paths in the process of performing what can only be called mini-migrations. � The Leopard Moth is a sizable beast as a caterpillar and as an adult. The adult (see here) is a real beauty � endowed with striking black circles against a white background. With a three inch wingspan and such a distinctive spot pattern, it earns the title. At the moment, however, this species is still in the larvae stage. The spiny caterpillars are fully furred and relatively un-distinguished except by the bright scarlet skin which is visible between the segments (see above). � This tactic is only put into play for a short time � as an immediate reaction. If over handled, or set down, the larva soon hangs the defense and goes for the running game. All 16 feet are put into play and the creature launches into a dead run.� If the thought of a running caterpillar is funny, wait until you actually see one in action. � All of this rushing will soon come to an end as the days get colder. 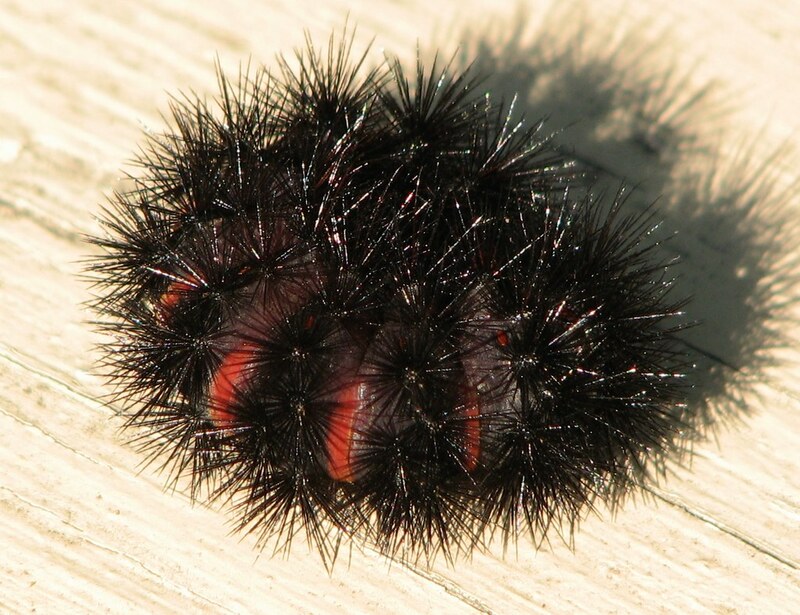 The Leopard moth caterpillar will �den� up under a log or deep in the leaf litter and wait out the winter. Spring will find him back into the running game, but only for a short while. He will then spin a cocoon, pupate, and emerge as a full fledged cat � changing his stripes along the way. �I have on my desk before me a small package of native goodness, but I�m not sure whether I want to open it or not. �It is the nut of an American Hazelnut – dried to perfection and literally falling out of its leafy husk – and I consider it a rare treat.� They are not very common around these parts anymore and it has been many years since I last found a nut of this species. ��I located a low growing shrub of an American Hazelnut earlier in the year and made a mental note to come back in the autumn to see if it produced any nuts. The plant had several male catkins on it, but no obvious female flowers (the ones that produce the nuts). To make a long story short, I came back and found that the shrub bore exactly two remaining nuts.� The fruit of this plant is highly desirable for wildlife and beating the local Red Squirrels, deer, and chipmunks to them is quite an accomplishment. I decided to photograph one and �harvest� the other one.� Now, because this native little nut is such a pretty little thing I can�t quite bring myself to cracking it open. 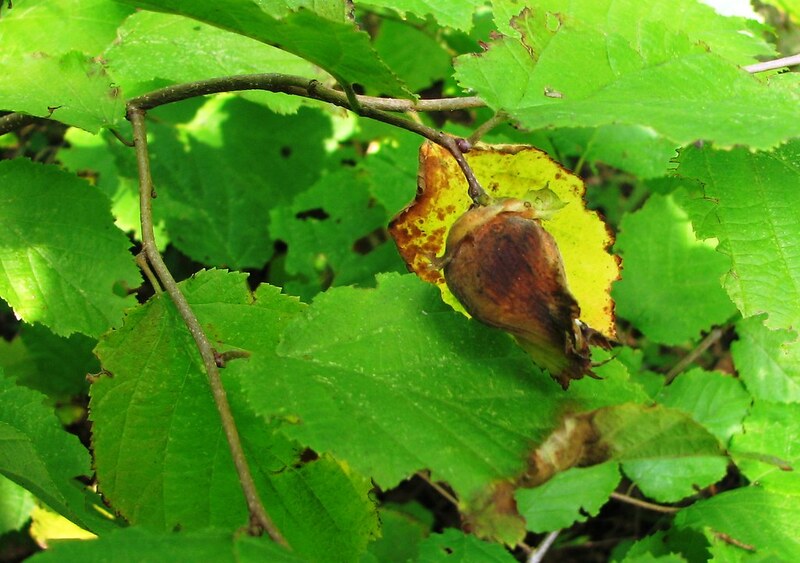 � Hazelnuts, also known as American Filberts, used to be a very common part of the forested undergrowth.� These are shade tolerant plants, but require a good dose of sunlight in order to complete their nutting efforts. They do best in the bright edge environs of our forests but such environs have been reduced and so the plants have been relegated to secret spots and reclusive habits.� There certainly is nothing distinctive about the leafy growth habit that would grab your attention (see here). � No, I�m going to stare at this thing a bit longer. I�ve already sketched it from several angles and even popped the nut out of its restraints to take a look at it. It represents an American harvest tradition of old � a nutty idea to be sure, but that�s it in a nutshell. � It was by chance that I met up with a very belligerent fellow on a recent blustery day. �It was a sizable bullfrog who was out of his element but well within his dignity.� I was out on the trail when I met up with a human couple walking their dog. Spotting my camera, they informed me that there was a big old bullfrog on the path ahead and that it was ready for a portrait.� Spotting their dog, I assumed that the frog would have been frightened away by the pet, but I thanked them anyway and walked on without expecting a frog encounter. � As I rounded the bend, I was concentrating on things above and failed to notice the thing below and directly in front of me. The object on the trail surprised me � especially given the fact that it was standing high and on all four legs. Here was the before mentioned bullfrog right where it had been left. The creature had no desire to move and was doing what it could in order to look intimidating. � Intimidation is normally not a word associated with frogs unless you refer to their being intimidated by nearly everything else on earth.� Frogs are built to jump and swim.� When on land, they jump about wildly in an effort to get back to the water where they can swim about wildly.� They are not cowards, but rather sensible amphibians that flee when the fleeing is good. 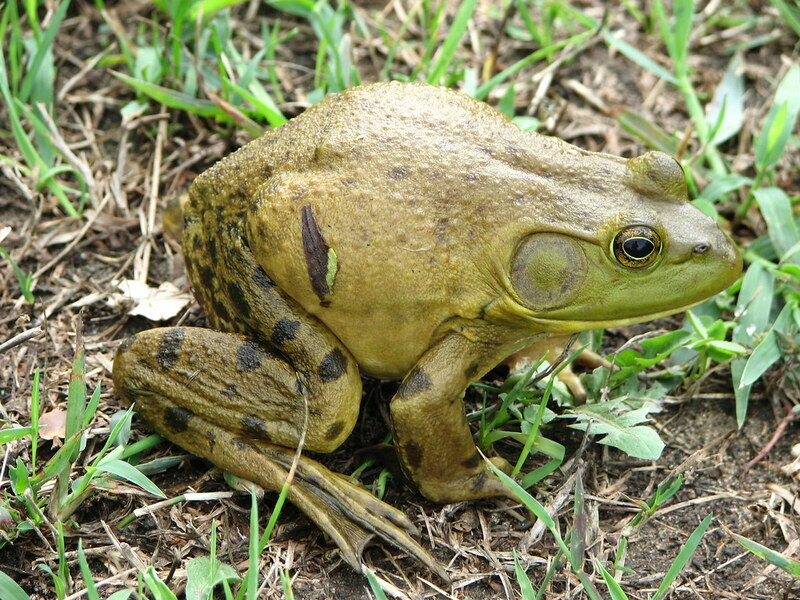 � This bullfrog would have no part of this flight tactic. �It rose itself up on all four legs until it was a good eight inches from the ground (alright, maybe it was only 6 inches). His hind legs being much longer, the frog�s hind end was lifted high into the air.� By inflating his body with air, he increased his girth as well. Overall, the final effect was unusual, if not intimidating, for a human observer. � When I backed off, he backed down. When I re-approached, he re-rose. All of this was performed without a single trace of emotion in his marble-like eyes. They were fixed onto some distant point on the horizon. The whole thing was mechanical, as if I was stepping on a trigger each time I advanced. � I attempted to make him move, but without success.� Usually a slight touch to the hind end will elicit a hop, but not in this case. He simple rose his hind end up to push away my finger.� I stomped on the ground, but he remained stationary and inflated a bit more.� A very light touch to the head caused him to lower his head at an extreme angle to the ground (see here). In my photo, it may look like I am pushing his head down, but this is not the case. � It�s not often that you get to see this behavior, so I felt it was worth recording. This belligerent bullfrog provides a great opportunity for you to observe his large circular eardrums � the distinctive trait of the male of the species. You�ll also note the grainy moist surface of his skin and the lack of a fold along the upper body.� When touched, the frog often brought a clear shield over the eyes, called a nictitating membrane (look closer here). This shield covers the eyes like a pair of goggles when the frog goes underwater and is pulled back for above-water viewing. The only thing this frog would not allow me to see was the southern view of himself going north. �� The belief that Jewelweed helps to stop the effects of Poison Ivy is nearly as prevalent as the plant itself.� In case of the ivy itches, so goes the saying, crumple up a bunch of Jewelweed leaves and briskly rub the affected spot to relieve the rash. �It is a nice idea, but baseless. The juicy leaves do provide some moist towelet action, but the weed offers no real chemical anti-dote to the ivy. � The Spotted Jewelweed has no need of any such false properties to make it worthy of attention. This late summer/autumn bloomer is an eye-catcher � especially on dewy mornings.� Jewel-like beads of water adorn every leaf (a possible reason behind the name) and the orange flowers glow in the low angled rays of the sunrise. 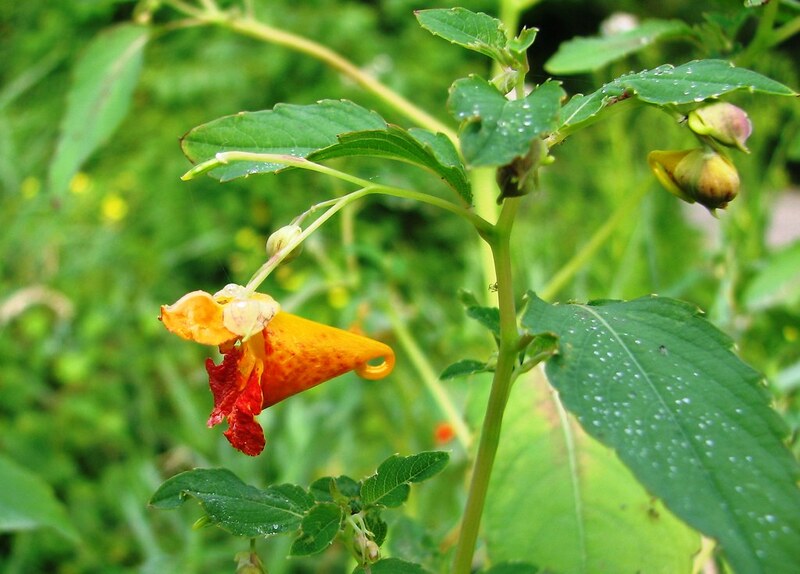 � Jewelweed flowers are shaped something like upside down elf shoes, with tubular openings and long spurs at the �toe.� �Hummingbirds and long-tongued bees are the primary pollinators. These critters are able to reach way back to the nectar reserve which is located in the spur. As they do so, they brush past the anthers and distribute the pollen. A few sneaky minded bees, however, have learned to chew holes in the spurs and bypass what nature intended. � One wonders if these sneaky nectar thieves are ever struck down by lightening for perpetrating crimes against the natural order?� I doubt they are, because these flowers are not the primary reproductive means of this plant. �It�s not nice to fool Mother Nature but, then again, she is not easily fooled. � Hidden in plain view among the showy flowers are dozens of tiny flowers without petals (see here). These micro blooms never open and are, in fact, the primary seed production sites. They are not subject to thievery or admiration. Like plain, but smart, sisters they go about their job in relative obscurity while their showy siblings get all the glory and only half the work done. � By the way, the next time you set off one of these little pods you should grab a few of the seeds and pop �em in your mouth. Then, while you�re at it, roll naked in a patch of Poison Ivy and bath yourself in jewelweed stems. The end result of this activity will be that you�ll discover that the seeds have a nice nutty taste and that Mother Nature has no mercy for stupidity. ������� I�ve never heard it before, but there is apparently an old saying that goes something like: �if there is dew on the lawn webs in the morning, it will be a beautiful day.� �This is basically true. It is a meteorological fact that a heavy morning dew is a good indication that it will not rain during the coming day. The reference to lawn webs has apparently been eliminated over the years due to the arachnophobic tendencies of suburban folk (this is not a fact, mind you, only a conjecture on my part). � Dew on the grass is certainly enough to provide the day�s forecast, but it is hard to see the droplets without close examination. I would like to suggest that the spider webs should be brought back into the picture. Wet websites can be seen from a good distance away and can provide the immediacy of a forecast much better than a dry internet weather web site can. Still, we�ve got to get over our fear of the webmaster in this case. � This bit of weather wisdom refers to the flat sheet-like weavings of funnel weaver spiders � a.k.a. �grass spiders.� What fall morning would be complete without the sight of several shimmering dew laden webs laid out on the grass like so many doilies? 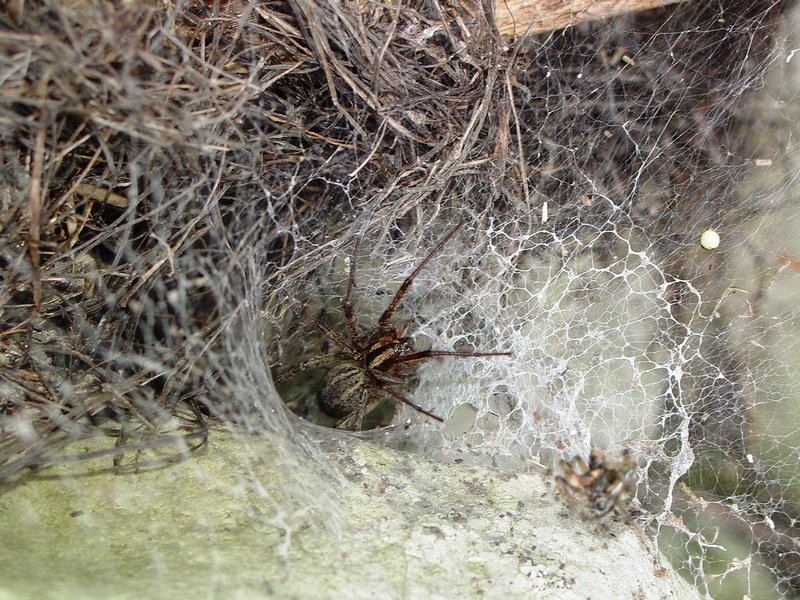 Funnel Weavers create a thick mat-like web which funnels down into a retreat chamber off the one side. They create their weavings over the surface of the grass, thick shrubbery, fence rails, and window ledges as a means to capture insect prey. Unlike other spiders, they do not destroy their web each evening, but repair or add to it every day. Hidden inside this tunnel lair (see above), or perched patiently at the entrance, the spider itself awaits breakfast in the form of a small stumbling creature. � I admit this leggy beast can look frightening � even dangerous. They can be up to �inch long (you always measure spider body length without the additional leg span) and even somewhat Buick-like if seen in the right circumstance. Grass spiders are brown, boldly striped, and typically endowed with long bristle covered legs.� Their spinnerets, the organs responsible for laying down the silk, extend like long stubby fingers from their back ends and, of course, there�s the thing about having eight eyes.� Even so equipped, Funnel weavers have poor eyesight and rely on touch sensitivity to tell them when �the first course� has arrived. � Normally, these shy critters scurry back into their dens at the passing of our shadow and are not aggressive or dangerous to people. Sure they�re venomous, but only to the extent that they can immobilize their tiny prey and that�s it. ��I was puzzled by the sight of an apparently un-fazed Funnel Weaver the other day. Given their skittish nature, I found it odd that this individual didn�t flee as I approached it. This individual stood in the hallway at the junction of the floor and wall and even appeared to be raising a leg in a threatening manner. Closer approach revealed that it was in an interesting predicament, however. This guy was caught in a web. Yes, I said �caught� in a web. It was thoroughly entangled by one leg and was partially hanging from this appendage (see here). � It took another half an hour, but the beast finally freed itself. It did so with some loss of dignity, but without loosing a third leg. There must be an old adage among funnel weavers that says something about not getting a leg up on the competition! � Have you ever been ticked off?� I mean, really ticked to the point where you couldn�t get back to normal for hours afterward?� Well, I have.� After a nice morning meadow walk recently, I found myself getting so ticked that I was still left de-ticking the following morning. Why, I was still feeling effects of the incident days afterward. No, I�m not talking about getting mad, I�m talking about getting evenly covered by the hitch-hiking seeds of the Tick Trefoil plant. 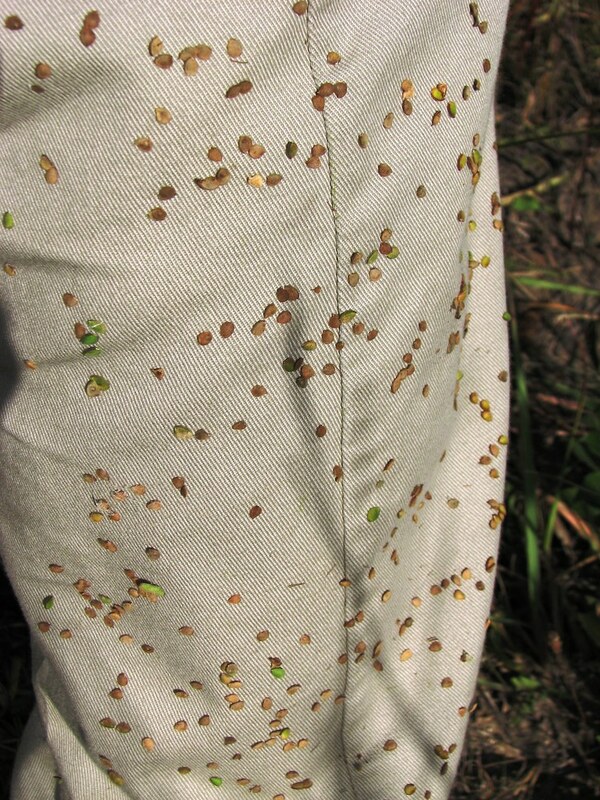 �When these seeds grab on for a ride, they are on for the full fare (see the pant leg above). � During the early summer months Tick Trefoils, grassland members of the Pea family, express their family ties with rich magenta and pink blossoms that look much like those�found on their�garden variety cousins. Different species have different sized flowers but all produce very un-gardenlike hairy seed pods (see here). As the plants mature they begin to lean over and gradually bend closer and closer to the ground (something like people in this regard, eh?). The intention -if you can say that a growth habit implies a motive – is for some hairy beast to come along, rub against the seed pods, carry off a few of the seeds, and take them for a long distance ride. This transport service is expected to be provided free of charge or at little cost. � When the Trefoils were developing their ingenious seed distribution scheme long ago, they did so with the idea that creatures such as woodchucks, deer, and rabbits would provide the taxi ride.� Hitch-hiking is a proven tactic for plants wishing to spread their ways. Burdock, Agrimony, and Enchanter�s Nightshade are a few other plants that have gone the four-legged delivery route. Humans were not part of the original plot, but their clothing proved to be the perfect transporting medium.� ��If my pant leg is any indication, this is a terribly effective method. � I counted an average density of about 12 seeds per square inch on my pant legs below the knee. After further careful calculations, I came up with the total figure of around 1,023 � attached seeds � O.K., I didn�t actually take my calculations that far.� Perhaps you can do the math and let me know how many square inches of pant leg there are on a pair of Size�wait a minute, this is getting too personal.� Never mind, let�s just say I harvested several handfuls of seeds � including a few located in deeply private locations which I discovered later. It�s really hard to explain exactly what you are doing when standing in line at Meijer�s while de-ticking! � Each Trefoil pod consists of a series of weakly linked segments that easily break apart on contact into separate triangular seeds (see here). They are covered with a fine coating of bristles which insures a Velcro-like adhesion to any rough surface. They cling tenaciously once attached. The common plant name, as well as the alternate names of �Tick Clover� or �Beggar Lice,� refers to this trait. � In nature, the unwilling animal seed carrier is supposed to gradually shed these seeds as they rub up against other plants or groom them off. Either way, there is a significant distance laid between the pick-up and drop-off sites and the plant has �done some travel�n� to new potential grounds. With fuel prices the way they are, this ride-sharing is an admirable idea.